In many ways, this commonality is welcome. It means that visitors don't have learn another system of navigation everytime they visit a new website. AJAXify yourself However, recent times has seen something of a resurgence in the creativity given to navigation design. For most part, this is being driven by AJAX and its ability to provide highly responsive interaction. For example, go to Microsoft.com and click on a link in the top right-hand corner of the page, e.g. Downloads & Trials. Instead of the usual screen response (i.e. bringing you to another page), the next level of navigation appears within a layer over the homepage. 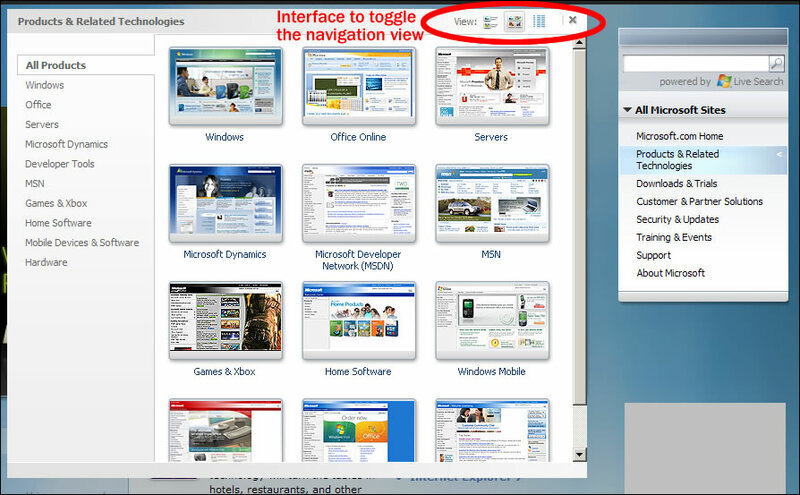 Within this layer, visitors can scan their options and even select a preference for how the navigation will appear, e.g. as page thumbnails, or as plain text. Other sites that make similar use of AJAX for navigation include Amazon.com, Marks & Spencer and many others. All for the good? Whether all this creativity will work for the benefit of user is yet to be seen. However, some time ago I attended a workshop with Jesse James Garrett (author of the excellent "Elements of User Experience"). In that session he lamented the loss of the creativity of the early internet. He suggested that many great interface and navigation models were thrown by the wayside, simply because things were moving too fast. Perhaps now is the time to rediscover those lost ideas.